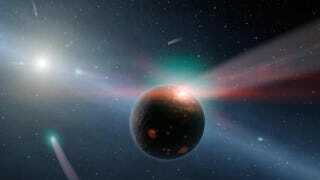 The Eta Corvi solar system is like a window into how our own solar system looked billions of years ago. All of Eta Corvi is being bombarded by giant comets — the exact same process that created Earth's oceans. Via the Jet Propulsion Laboratory. Image by NASA/JPL-Caltech.